Pregnancy toxaemia is a common metabolic disorder of ewes that is caused by the increased energy requirements in the late stage of pregnancy being greater than the energy provided by the diet consumed. It occurs in sheep usually carrying multiple foetuses. It is widespread and may affect any age or breed of pregnant ewe. Ewes in over-fat or very poor condition are most at risk. While many factors contribute to body condition, ewes which are in poor body condition at mating are invariably in low condition during late pregnancy and are predisposed to pregnancy toxaemia. Pregnancy toxaemia is characterised by hypoglycaemia[/tooltip] and hyperketonaemia resulting in the animal being unable to maintain an adequate energy balance (Cal-Pereyra et al., 2015). There are two factors involved in the development of hypoglycaemia. The glucose requirement of the uterus may increase to more than 40% of the total liver glucose output (Lindsay and Oddy, 1985). This situation may be exacerbated by the limited feed intake of the ewe due to the volume of the uterus in late pregnancy. (DMI decreases from 1.54 kg at day 130 to 1.25 kg at day 145 of pregnancy). The endocrinological status of the ewe changes in late pregnancy. The lower circulating levels of insulin, together with higher levels of growth hormone, progesterone and prolactin in late pregnancy, tend to encourage hypoglycaemia (Vernon et al., 1981). Hypoglycaemia is usually followed by hyperketonaemia (Scott and Woodman, 1993). This is due to increased fat mobilisation (fat released from stores to be converted into energy). 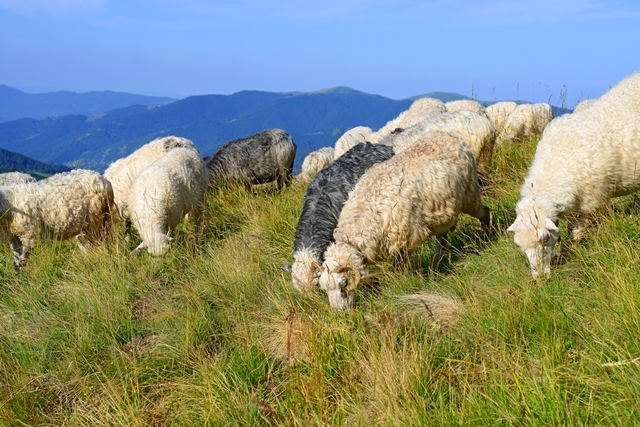 The resulting ketone bodies can be used as a source of energy, but excess will result in hyperketonaemia, which in the toxaemic ewe is accompanied by metabolic acidosis. Some of the fatty acids escape oxidation and instead are reconverted into fat, which is deposited in the liver (Henze et al., 1998). Hence, a typical feature of pregnancy is fatty infiltration of the liver and kidneys, indicating a major disturbance of the fat and carbohydrate metabolism (Henderson et al., 1982) or “fatty liver”. The ewe is anorexic and isolates herself from the rest of the flock. Foetal death in utero is common and may result in some improvement of the ewe’s condition. The ewe may have to be assisted lambing these dead lambs. Up to 90% of the ewes affected may die if left untreated (Hay and Baird, 1991). Concurrent hypocalcaemia and/or hypomagnesaemia may complicate the clinical picture. Maintaining ewes at optimal condition of 2.5 – 3 during the late stage of pregnancy and 2-2.5 at lambing will help minimize pregnancy toxaemia. Click on the image to download the AHDB Beef and Lamb guidance on how to condition score ewes. The energy requirements of pregnant ewes are highest during the last 6 weeks of pregnancy, when 70 % of the lamb’s birth weight is gained. 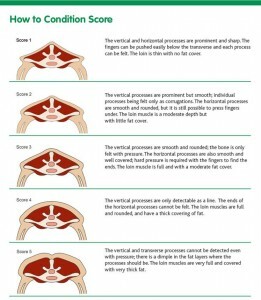 Ideally, the ewes should have a body condition score of 2.5-3 six weeks prior to lambing and at least 2-2.5 at lambing. Over-fat ewes are also vulnerable to pregnancy toxaemia, as they are more prone to losing their appetite during late pregnancy (Henderson, 1990). If ewes are exclusively grass-fed, special emphasis should be placed on feeding high quality roughage to ewes in late pregnancy. The quality of the feedstuffs available should be analysed for energy and protein levels and the diet calculated accordingly. Methods of calculating diets based on the dietary requirements of the pregnant ewes are well researched. Discuss with your vet or agricultural merchant about having your forage analysed. Measuring blood metabolites (3-hydroxybutyrate) of the ewes can assess the adequacy of the diet. Health problems, such as footrot, should be treated, and emergency food rations kept at hand in case of extreme weather conditions (Hay and Baird, 1991). The first is to reduce the ewe’s glucose requirements, either by caesarean section or by artificially inducing parturition using corticosteroids. This can only be done in early cases, and the course of action must be discussed with the farm vet. Close monitoring is vital after induction, as dystocia is likely in such cases. This course of action may save the ewe and, if near term, the lambs (Ford and Evans, 1986; Hunt, 1976). The second is to increase blood glucose using various remedies. In early cases, oral dosing with glycerol and propylene glycol works best. Intravenous injection with glucose may be used, but requires repeating and may require the concomitant use of glycerol and propylene glycol orally. Sodium bicarbonate may be administered to help counteract acidosis (Andrews, 1982; Marchant, 1997; Wierda et al., 1985). A concentrated oral rehydration solution may also be used (Buswell et al., 1986). Simultaneous treatment with intravenous calcium may be warranted if concurrent hypocalcaemia exists. Treatment must be frequent and vigorous during the early stages to be successful as the pathological changes associated with hypoglycaemic encephalopathy become irreversible during the later stages of pregnancy toxaemia. The affected ewes should be given palatable feed and protected from the weather and bullying flockmates. Special care should be provided to blind ewes. 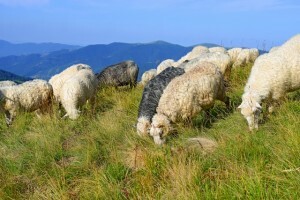 Severely affected ewes may have to be humanely destroyed. Early cases indicate there may be a nutritional problem that needs immediate correction to prevent further cases (e.g. poor quality forage in late pregnancy). Ewes affected by pregnancy toxaemia should be treated without delay. Severe cases should be humanely destroyed. In the case of a general farm problem with pregnancy toxaemia, the feeding practices will have to be reviewed and adjusted to prevent future cases. Farms which have had problems in the past with pregnancy toxaemia should have feeding practices reviewed and adjusted as part of the overall Flock Health Plan.